Raumfahrt+Astronomie-Blog von CENAP - Blog: UFO-Forschung - Curiosity von UFOs beobachtet? UFO-Forschung - Curiosity von UFOs beobachtet? Ever since we launched planetary spacecraft beginning in the late 1950s, UFO-spotters have eagerly anticipated our running across alien spaceships flitting around. Rather than just accidentally crossing at a cosmic intersection, the legend is that extraterrestrials are watching us explore the solar system. Based on the long history of supposed close encounters, I anticipated that not long after NASA's Mars Science Laboratory (MSL) landed, folks would begin reporting "strange things" in Martian skies. And sure enough, several reports of UFOs buzzing the Gale crater landing site have surfaced in the past few weeks following the celebrated touchdown of Mars rover Curiosity. Several years ago I was sent an hour-long videotape that had been edited from NASA downlink video of the Hubble Space Telescope astronaut servicing missions showing white dots coming and going in the background. This too is simply noise or data dropout in the television transmission. There are many other similar examples on Youtube of alleged UFOs hanging around other shuttle missions. A number of purported UFO sightings -- far too numerous to debunk here -- surround the 1969 Apollo 11 moon landing. Neil Armstrong categorically denied these. Several years ago Buzz Aldrin gave CNN host, Larry King, a long shaggy dog story about being trailed by "UFOs." Aldrin finally said that the UFOs where likely pieces of the Saturn V third stage that was flying on the same lunar trajectory as the Apollo capsule. Astronomical images are also pawed off as UFOs, but are really images of planets or bright stars. Venus is so bright that it can produce a "bleed" in a camera CCD detector that looks like it sprouted wings. My favorite is a photo of a bizarre x-shaped pattern (a video of which is shown below) that the Hubble Space Telescope photographed. It was produced by the collision of two asteroids. Nevertheless, I received several e-mails insisting that it is some sort of spaceship. A joke among my colleagues was that it was "decloaking." One person Photoshopped the image and turned it into a frowning alien face. These anecdotes are just a small sample of a seemingly endless Rorschach of alien signatures embedded in the photo tapestry of the surfaces numerous solar system bodies. The legendary face on Mars, first photographed in 1976, is the grandfather of all this nonsense. In 2001, the folks at NASA finally got around to re-photographing the feature in high-resolution and at a different sun angle and, guess what, it's simply a mesa -- though some "true believers" still hang onto the idea it is artificial. 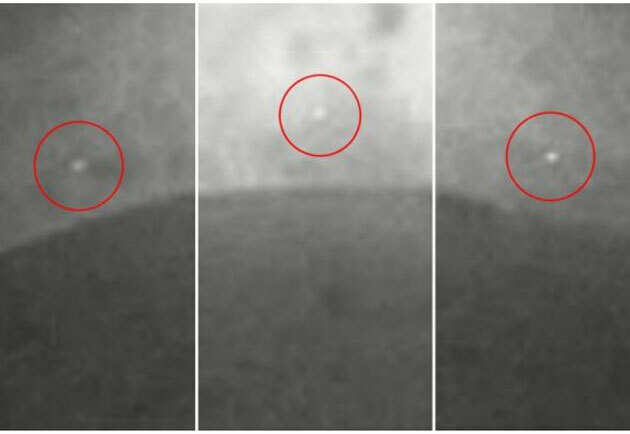 More recently, a UFO group claimed to have found a crashed spaceship on the asteroid Vesta, as photographed by NASA’s Dawn mission. The white splat looks a little interesting, except it is fundamentally no different from gazillions of natural objects that have plowed into the ancient body. This whole UFO photo sleuth cottage industry on the Internet underscores my admonition that one man’s noise is another man’s data. All kinds of interpretations are thrown at mundane and vastly unconvincing images. Simply show me just one photo of a starship that unequivocally looks like an extraordinary example of far advanced engineering. ANALYSIS: Could Terrorist Aliens Cyberattack Us? When the space images fail to be taken as proof, UFO believers frequently fall back on allegations of government cover-ups of the really good pictures, and conspiracies to censor astronauts. This is symptomatic of a pseudoscience. Never mind that supposed evidence for pyramids, forts, bridges, bases, excavation sites and other alien constructions are extracted from thousands of photos that are openly available online from a fleet of NASA planetary orbiters. The barrage of anemic or bogus evidence for UFOs aside, there is also a gaping hole in logic when alleging there are snoopy aliens. For starters, no advanced forms of life would make the long and expensive journey here to watch such comparatively mundane activities as humans walking on a moon, or an insect-brain robot rolling a few miles across a barren red planet. This is simple a terribly naïve projection of how we think aliens would think. What's more, it's pretty nonsensical to imagine that aliens would zoom across many light-years only to be hapless enough to have a head-on collision with the asteroid Vesta! Who's at the steering wheel? The cartoon alien Roger form the TV show "American Dad"?